KETV - Omaha, Nebraska. Fri, 26 Apr 2019 00:42:00 GMT. Oxford Assistant Fire Chief Timothy Hora, 30, has been accused of setting at least seven field fires in the area over the past month. He is facing five counts of arson and public intoxication. Daily Mail. Thu, 25 Apr 2019 18:03:04 GMT. Chicago Tribune Staff. Chicago Tribune. Thu, 25 Apr 2019 04:35:00 PDT. Rep. Andy McKean changed his party affiliation from Republican to Democrat, citing President Donald Trump's -- and the GOP's -- policies and behavior. ABC News. Wed, 24 Apr 2019 14:57:44 -0400. Officials say late-winter moisture, flooding and low temperatures have delayed corn and other plantings in Nebraska and in some parts of Iowa. KETV - Omaha, Nebraska. Wed, 24 Apr 2019 17:37:00 GMT. Associated Press. Chicago Tribune. Tue, 23 Apr 2019 10:25:00 PDT. WWE Raw news, notes and business analysis on Monday, Apri 22, 2019 from Des Moines, Ia. By Alfred Konuwa, Contributor. Forbes. Tue, 23 Apr 2019 03:04:00 +0000. ABC News. Mon, 22 Apr 2019 08:30:32 -0400. Clay Masters. NPR. Sun, 21 Apr 2019 07:00:00 -0400. ESPN. Fri, 19 Apr 2019 14:22:12 EST. CBS News. Wed, 17 Apr 2019 17:58:30 +0000. A team of undergraduate students at Drake University in Iowa is developing a magnetic shield to defend interplanetary astronauts from the intense cosmic radiation between Earth and Mars. Live Science. Tue, 16 Apr 2019 11:45:00 EDT. According to the 2010 census, the population of Iowa was 3,046,355. In 2008, the estimated population of Iowa was 3,002,555, whereas in 2006, the population of Iowa was about 2,967,270. For detailed, up-to-date information about Iowa's demographics, visit the U.S. Census Bureau's QuickFacts about Iowa web page. For maps of Iowa, visit this Iowa Map website. 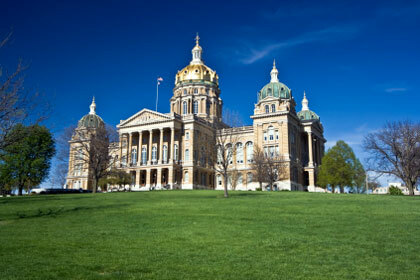 The photograph above shows the state capitol building in Des Moines, Iowa. Iowa newspaper publishers are listed here, along with their addresses, phone numbers, and website links; Iowa library names, descriptions, and website links are listed on this page. More information about Iowa can be found here.